The “complete streets” movement has taken the United States by storm, and has even taken root in countries such as Canada and Australia. Few movements have done so much to influence needed policy change in the transportation world. As of today, almost 300 jurisdictions around the U.S. have adopted complete streets policies or have committed to do so. This is an amazing accomplishment that sets the stage for communities to reframe their future around people instead of cars. Getting transportation professionals to think about including pedestrians, bicyclists, and transit users is a key first step in creating great places and livable communities. But that is not enough to make places that truly work for people -- “streets as places.” The planning process itself needs to be turned upside-down. We at PPS like to say that engineers can ruin a good street, but they cannot create a good street -- a street that is truly complete -- through engineering alone. A small but growing group of communities have recognized that to really “complete their streets,” they need genuinely place-based and community-based transportation policies that go beyond routine accommodation. “The design of a street is only one aspect of its effectiveness. How the street fits within the surrounding transportation network and supports adjacent land uses will also be important to its effectiveness.” -- Charlotte "Urban Street Design Guidelines"
‍This illustration from Indianapolis's "Multimodal Corridor and Public Space Design Guidelines" reflects how the new wave of street policies specifies Placemaking guidance as well as how to accommodate all modes. Communities such as Indianapolis, Charlotte, Savannah, San Francisco, and Denver have created community-based street policies that turn the transportation planning and design process upside-down, acknowledging that the role of streets is to build communities, not the other way around. The example from the Indianapolis "Multimodal Corridor and Public Space Design Guidelines" illustrates how this new genre of street policies specifies Placemaking guidance as well as how to accommodate all modes. PPS is helping communities realize a different vision of what transportation can be. We’ve worked in small communities in rural areas, such as Brunswick, Me. ; Newport, Vt.; and Tupelo, Miss. We’ve gone to larger communities such as San Antonio, Tex., Los Angeles, and San Francisco. On our travels, we’ve conducted capacity-building workshops, helped develop street typologies, created visions for right-sized streets, and worked on community-based transportation policies. Place-based plans, policies, and programs allow downtown and village streets to become destinations worth visiting, not just throughways to and from the workplace or the regional mall. Transit stops and stations can make commuting by rail or bus a pleasure. Neighborhood streets can be places where parents feel safe letting their children play, and commercial strips can be designed as grand boulevards, safe for walking and cycling, allowing for both through and local traffic. Countries outside the U.S. are not immune from focusing on street design as an isolated discipline. After World War II, many countries around the world became enamored of a planning approach that was driven by traffic engineering. 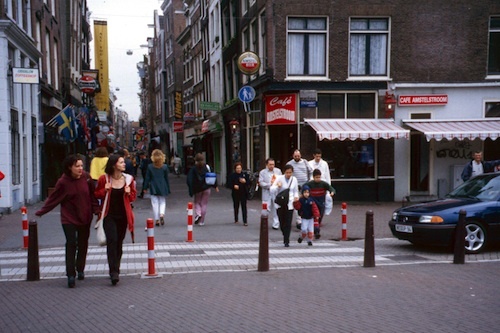 Some, like the Netherlands, reversed course relatively quickly and returned to community-based, livable street design. Ultimately, the Dutch went even further in the right direction, in part thanks to the influence of the legendary Hans Monderman (himself a traffic engineer), who developed and promoted the concept of “Shared Space.” Monderman’s designs emphasized human interaction over mechanical traffic devices. By taking away conventional regulatory traffic controls, he proved that human interaction and caution would naturally yield a safer, more pleasant environment for motorists, pedestrians and cyclists. We are poised to create a future where priority is given to the appropriate mode, whether it be pedestrian, bicycle, transit, or automobile. Cars have their place, but the rediscovered importance of walking and "alternative transportation modes" will bring more people out onto the streets -- allowing these spaces to serve as public forums where neighbors and friends can connect with one another. In order to truly complete our streets, they need to be planned and designed appropriately, using the following guidelines. Not so long ago, this idea was considered preposterous in many communities. "Public space" meant parks and little else. Transit stops were simply places to wait. Streets had been surrendered to traffic for so long that we forgot they could be public spaces. Now we are slowly getting away from this narrow perception of streets as conduits for cars and beginning to think of streets as places. Streets and parking can take up as much as a third of a community's land, and designing them solely for the comfort of people in cars, and then only for the most congested hour of the day, has significant ramifications for the livability and economics of a community. Under the planning and engineering principles of the past 70 years, people have for all intents and purposes given up their rights to this public property. Streets were once a place where we stopped for conversation and children played, but now they are the exclusive domain of cars. Even when sidewalks are present along high-speed streets, they feel inhospitable and out of place. The road, the parking lot, the transit terminal -- these places can serve more than one mode (cars) and more than one purpose (movement). Sidewalks are the urban arterials of cities. Make them wide, well lit, stylish, and accommodating. Give them benches, outdoor cafés, and public art. 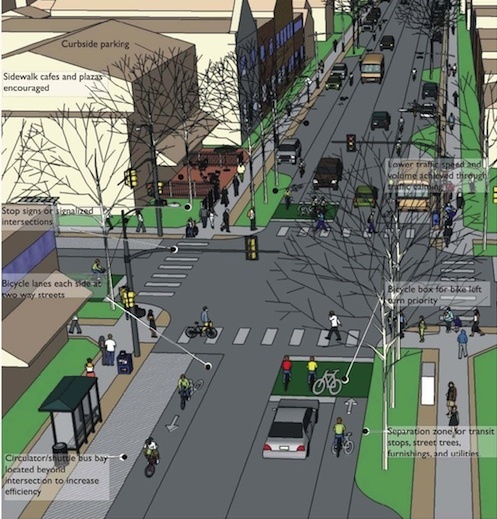 Roads can be shared spaces, with pedestrian refuges, bike lanes, and on-street parking. Parking lots can become public markets on weekends. Even major urban arterials can be designed to provide for dedicated bus lanes, well-designed bus stops that serve as gathering places, and multimodal facilities for bus rapid transit or other forms of travel. Roads are places too! Communities need to first envision what kinds of places and interactions they want to support, then plan a transportation system consistent with this collective community vision. Transportation is a means for accomplishing important goals -- like economic productivity and social engagement -- not an end in itself. Great transportation facilities truly improve the public realm. They add value to adjacent properties and to the community as a whole. Streets that fit community contexts help increase developable land, create open space, and reconnect communities to their neighbors, a waterfront, or a park. They can reduce household dependency on the automobile, allowing children to walk to school, and helping build healthier lifestyles by increasing the potential to walk or cycle. Think public benefit, not just private convenience. 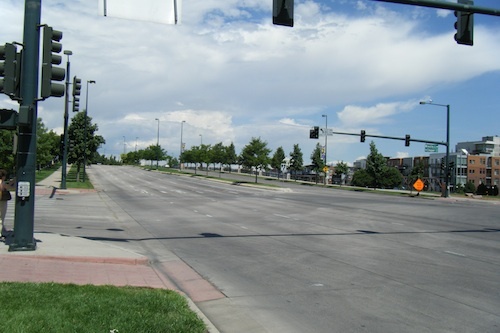 ‍Due to peak-hour design, Speer Boulevard in Denver limits the northward expansion of downtown Denver while remaining empty at midday. Instead of adding value to the community, it actually limits the city economically, socially, and in every other way. It doesn't even do what it was designed to do: solve congestion during peak hour. I-25, just to the north at the top of the photo, is bumper to bumper during peak hours. The 10-lane cross-sections become a mere parking lot. Designing street networks around places benefits the overall transportation system. Great places -- popular spots with a good mix of people and activities, which can be comfortably reached by foot, bike, and transit -- put little strain on the transportation system. Poor land use planning, by contrast, generates thousands of unnecessary vehicle trips, clogging up roads and further degrading the quality of adjacent places. 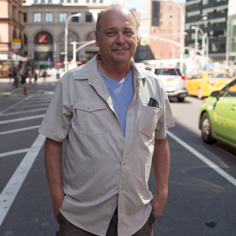 Transportation professionals can no longer pretend that land use is not their business. Transportation projects that were not integrated with land use planning have created too many negative impacts to ignore. Transportation -- the process of going to a place -- can be wonderful if we rethink the idea of transportation itself. We must remember that transportation is the journey; enhancing the community is the goal. Streets need to be designed in a way that induces traffic speeds appropriate for that particular context. Whereas freeways -- which must not drive through the hearts of cities -- should accommodate regional mobility, speeds on other roads need to reflect that these are places for people, not just conduits for cars. Desired speeds can be attained with a number of design tools, including changes in roadway widths and intersection design. Placemaking can also be a strategy for controlling speeds,. Minimal building setbacks, trees, and sidewalks with lots of activity can affect the speed at which motorists comfortably drive. Speed kills the sense of place. Cities and town centers are destinations, not raceways, and commerce needs traffic -- foot traffic. You cannot buy a dress from the driver’s seat of a car. Access, not automobiles, should be the priority in city centers. Don't ban cars, but remove the presumption in their favor. People first! Complete streets policies support these three rules. More importantly, they open the door for new ways of thinking about how the transportation profession should approach streets. But communities cannot get complacent and expect transportation planners to carry the whole load of creating great places. Instead, community leaders and advocates need to collaborate with the profession to tap their engineering skills to help build streets that are places. Using an “upside-down planning approach,” this new collaboration can help the United State achieve success in tackling public health problems, climate change, energy consumption, and a failing economy. We can once again foster streets that are the cornerstone of great places. To see the palette of PPS tools that are available to help you create streets that are places and foster “Building Communities Through Transportation,” visit our transportation services page.